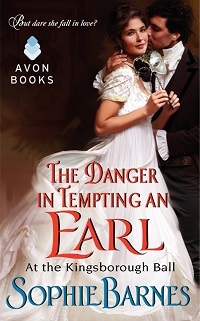 Thank you for stopping in to check out my review of Sophie Barnes’ new release, The Danger in Tempting an Earl, book 3 in the At the Kingsborough Ball series. Please be sure to check out the other tour stops, and don’t forget to enter the tour-wide giveaway where the Grand Prize is for The complete Kingsborough Ball collection (autographed), a black masquerade mask, a Croft & Barrow jewelry set, a grey silk shawl, bookmarks and magnets AND two lucky winners will get a copy of THE SCANDAL IN KISSING AN HEIR by Sophie Barnes. Returning to this series after the first book, a lovely Cinderella retelling, this story carries the feel of Emma (by Austen) and is even referenced in the story itself. Barnes weaves a familiar-feeling story with her own twists to mix things up a bit, and comes out with an enjoyable story, despite a rather troublesome heroine.Lucien has been on the continent for a few years only to return to assume the title of Earl of Roxbury, and take up residence in England once again. His life-long friend Katherine has been the object of his desire and love for years, but she has firmly planted him in the ‘friend zone’, so leaving England was his best alternative to pining after her marriage to someone else. When he returns to find her widowed, his hopes are restored, and he sets his sights on winning her. Katherine was a bit uptight, with an apparent remove from her own emotional responses. While she longs to regain the once-comfortable friendship with Lucien, her bad marriage experience has decided her on remaining the widow, and she isn’t sure that she can cope with the emotions Lucien fuels. She’s a bit of a pain in the arse actually, blowing hot and cold and FAR too interested in what others think about her. Fortunately for her, she has a group of friends that add levity and brightness to her, and her moments with her daughter and her desire to provide for her all give her heart that is sorely missing. Lucien decides that wooing and seduction are in order, and he sets forth to do just that: but a thread of a threat to her life, and a shooting and shooter uncovered at the Kingsborough ball all conspire to make his job a bit more difficult, if not adding a great deal of intrigue or tension to the plot (for me). Frankly, when the threat to Katherine was unmasked, I wouldn’t have missed her if it weren’t for Lucien’s determination and insistence that she is worth his adoration. Yes, it took several years and plenty of missteps for both characters, but Barnes manages to bring them together in a pleasant and pleasing way, and show the friends to lovers story can be all the sweeter for the time apart. Louise shrugged. “What can I say? I suppose there are always those who would like to turn the simplest thing into a complicated Banburry tale. Although…” The word trailed off into obscurity.With a sigh of resignation, Katherine accepted Louise’s bait and asked the question her friend so obviously intended for her to ask. “Although what?”“Well, if Roxberry is indeed in love with you, then he certainly planned his return with perfect timing considering that you are just now out of mourning and free to contemplate another gentleman in your life.”“Good heavens but this is madness!” Katherine would rather eat poison than consider attaching herself to another gentleman, so the idea that this might be the consensus of the entire tonwas horrifying. “They’re wrong, Louise. I’ve known Roxberry my entire life and I’m telling you that he has never considered me as anything more than a friend.”Louise nodded. “Perhaps you’re right,” she said, patting her arm as if to placate her. “After all, you do know him better than anyone else so if you are certain in your assessment, then I have no choice but to trust your judgment.”“Thank you,” Katherine managed. She felt as if she’d just run a three-legged race. Oh dear God, there was more. Louise wafted her fan back and forth with increased vigor.